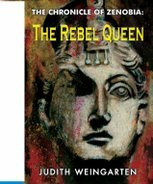 ... you may imagine something on the order of "Why oh why is she dressed in Roman military drag, for heaven's sake; those are her enemies? What's wrong with Palmyran military outfits?" Or with a disapproving click of the tongue, "Why is she wearing a muscled breastplate? 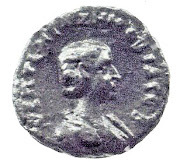 That went out of fashion - even for Roman commanders - ages ago." Or, "She's holding a Roman parade-ground mask instead of a battle helmet; she won't be able to see a thing on the battlefield with that on." And then, tutting under my breath "She's showing bare legs." That would have have marked her as a harlot as surely in third-century Syria as it would on the streets of Dubai today. But, no, not a bit of it. There will be no tutting about her costume. Instead, I am going to talk about her sword. You will notice that it is curved. "Yes", you say, "Arab swords tend to be curved." Exactly. 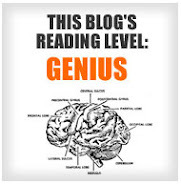 The subliminal message is clear. It is also entirely wrong. The curved sword is a terrible anachronism ... by about 1100 years. Let's first go back to Palmyra: their swords, like Roman swords, were always double-edged and straight. Always. No exceptions. On the right, the remains of a1st-century AD Palmyran officer (and do note his cuirass of scale armour; no old muscled stuff for him): he carries a Roman gladius-type sword, a short but quite murderous weapon used primarily for thrusting. 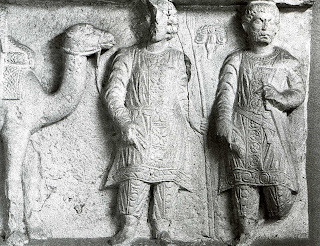 This elegantly dressed Chief Merchant (left), who lived a little before Zenobia's time in the 3rd-century AD, wears a long sword. This sword is very similar to the Roman spatha -- the long slashing sword of choice from the end of the 2nd century onwards. Roman soldiers usually wore the spatha suspended from a baldric but our Palmyran nobleman lets it hang from a waist band - presumably a lighter weapon than the military issue. On the other side of the Euphrates, the Sassanian-Persians, too, were armed with long straight swords, and that remained the Persian blade until the very end of their days of empire. On the left, you see a particularly fine 7th-century Sassanian sword and scabbard (Metropolitan Museum of Art): it has an entirely straight iron blade; the wooden scabbard is covered with gold and embellished with garnets and glass-paste. When the Arabs overthrew the last Sassanian rulers and went on to conquer Syria, Egypt and points west, Mohammed and his later successors were fighting with swords like those on the right (Istanbul Military Museum, 7th-8th centuries). And so it goes. The swords used by Arab warriors right through the 12th and 13th centuries were almost always straight, double-edged weapons not very different from those of the conquest period. 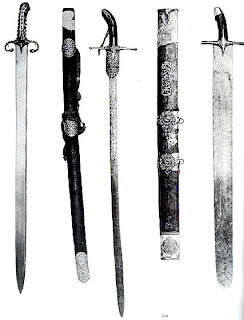 It is not until near the end of the 13th century that curved, single-edged blades are introduced and they only slowly become the common weapon of Arab warriors. A Persian/Turkman miniature dated 1388 from Shahnameh (The Book of Kings) shows combat with long straight swords still at this late date. The change from straight swords to the curved saber in the Levant and Arabian peninsula occurred after the Turkish Selçuk migration into Anatolia. They brought with them the 13th century Turko-Mongol saber. This simple, one handed, curved blade originated in Central Asia and was widely used by the Turkic peoples of the region and by the Mongols. 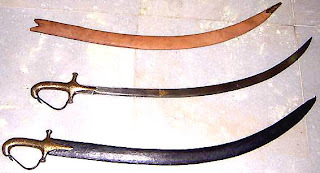 These are single-handed swords, sporting a single edged, variably curved blade. Its slashing, chopping effectiveness for mounted warriors had lasting effects in the Arab/Islamic world, Persia, India and Eastern Europe as well. The Turko-Mongol saber birthed the entire saber design; its descendants in turn produced even more kinds of curved swords. Swords ranged from only slightly curved to moderately curved until, in the 15th century, the Persians developed the highly curved scimitar (meaning 'tail of the lion'). 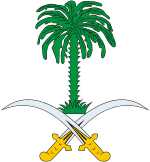 The scimitar soon became the characteristic Arab sword, an image now indelibly associated with Arabs - not only in the minds of Westerners, but of Arabs themselves .... as witness the Saudi Arabian coat of arms. All cultures, without exception, shape their pasts for political purposes of the present. Still, it is the historian's job to point out when such pasts are completely groundless.